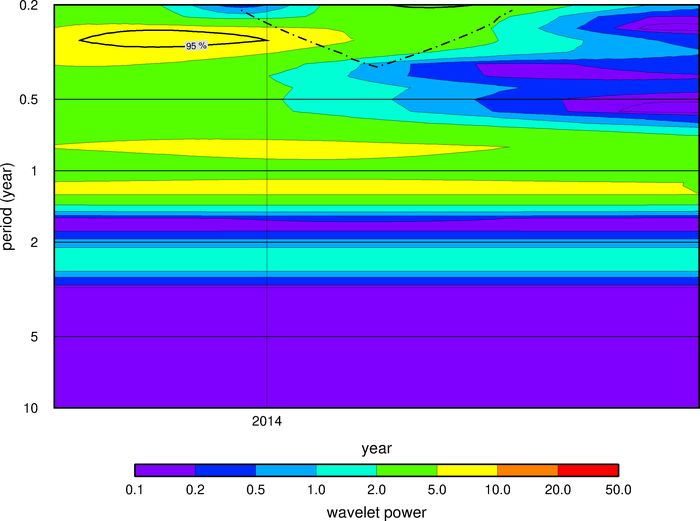 The wavelet power spectrum (wsd) of the geostrophic transport time series of the Agulhas Current. The peak-based significance level is computed at 95%. The dotted line indicates the cone of influence (COI). Edge effects become important in region of the wavelet spectrum below the COI . This wavelet is updated on a monthly basis using near real time altimetry data (4 week delay). Last updated on 02/28/19 02:20 pm.